A 'Ruby Murray' may live on as a cheeky piece of cockney rhyming slang for an Indian dinner, but so too does the memory of the legendary singer whose name sprang so readily to the lips of the person that first used it in that context. For Ruby's voice became familiar to all who lived in Britain during the 1950s and her name, indeed, became a household word. Ruby Murray was a precocious youngster and she began her entertainment career as a child singer in and around her home city. She was still in her teens when she replaced Joan Regan on the BBC TV programme 'Quite Contrary'. However, it was not her youth but her beautiful voice that caught the mood of the British public; sweet and gentle, but full of character. She was widely regarded as the 'voice of Ireland' and she soon became one of the most significant performers in the UK and Ireland during the decade. She appeared in numerous shows and once even under the direction of Gordon Parry in the 1956 comedy movie 'A Touch Of The Sun'. However, it was her recording career that would prove to be the most astonishing. Her early chart hits came like 'a ton of bricks', first came 'Heartbeat' followed by a string of top ten entries including her massive #1, 'Softly, Softly'. She had no less than five records in the top twenty chart simultaneously (all of her first five full releases!) - a feat that occurred during March, 1955. Despite her strong associations with Northern Ireland she made her home in England following her marriage in 1957. 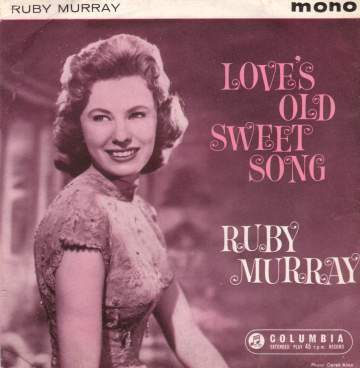 There are quite a number of EPs around issued in Ruby's name, mostly issued during the mid to late 1950s. However, the one shown on the left (SEG8052) was not issued until 1960. I seem to come across it fairly regularly so it is possibly the easiest of her output on that format to find. Sadly, by the end of the 1950s, Ruby's chart career was over. Her choice of material, and her image, were perhaps a little too sentimental for the less innocent era of the 1960s. However, she remained a popular performer and her LP recordings were far from ignored even into the 1970s. She continued to perform regularly, though in later years, inevitably for one who had been such a great star, she became regarded as a nostaligia act and fans really just wanted to hear her sing her famous hits. Ruby Murray died on December 18th 1996. Collector's Items are shown In Red. Ruby's first release (Heartbeat) was originally issued on 78rpm. Several of her other earlier issues are also very difficult to find on 45rpm and most of the singles listed below for 1956 were special issues. Note: 'Connemara' was sung with Brendan O'Dowde, 'Boy Meets Girl' was with Norman Wisdom, 'If Anyone Finds This, I Love You' was with Anne Warren. Columbia SEG7588 1956 "Ruby Is A Gem"
Columbia SEG7620 1956 "Everybody's Sweetheart No.1"
Columbia SEG7631 1957 "Everybody's Sweetheart No.2"
Columbia SEG7636 1957 "Everybody's Sweetheart No.3"
Columbia SEG7952 1959 "Endearing Young Charms"
Columbia SEG8052 (ESG7830) 1960 "Love's Old Sweet Song"